As a Partner, you not only become connected with everything we do, but you also share in the reward that comes to those who send the message of our Messiah to those who are broken, lost, hurting, and alone. “Behold, I am coming quickly, and My reward is with Me, to render to every man according to what he has done” (Revelation 22:12). Together we are making a difference and together we are preparing the way for the return of King Jesus. Amen! “Therefore we ought to support such men, so that we may be fellow workers with the truth” (3 John 1:8). As a Partner, you come along side Rabbi Schneider; literally helping to bring the Good News to millions of people around the world! When you are a Partner, just like Cori, you “spiritually” go with Rabbi to places like Africa and Haiti: becoming part of the ministry team that proclaims hope, salvation, and deliverance. You will begin to experience the Blessings of a covenant relationship with Rabbi, as you share in the “Fruit” of this soul winning ministry. Imagine becoming part of every salvation decision and every testimony received! Jesus said to him, “I am the way, and the truth, and the life; no one comes to the Father but through Me” (John 14:6). At the very core of everything we do, and will continue to do, is a commitment to Biblical truth. Rabbi’s unique insights of integrating the Old and New Testaments bring clarity to God’s Word and the understanding that there is no other way, no other truth, and no other life- than Jesus! “Give, and it will be given to you. They will pour into your lap a good measure – pressed down, shaken together, and running over. For by your standard of measure it will be measured to you in return” (Luke 6:38). 3 special, Partner-Only DVDs as a Gift from Rabbi to you (please see details below). Personal Prayer Call: One of Rabbi’s Prayer Team members will call and pray for you 3 times per year. Seeds of Revelation: A powerful video sent weekly from Rabbi directly to your inbox. Rabbi’s Prayer Team weekly lifts up all of our Partners in prayer. Monthly Newsletter with teachings from Rabbi & Cynthia, Crusade updates, special announcement, and much more. Monthly Teaching CD: Rabbi speaking faith, truth, and revelation into your life. When you become a Partner, Rabbi wants to say “Thank You” by sending you three special Partner Only DVDs. Rabbi shares his personal story. Includes never before seen pictures and video footage! 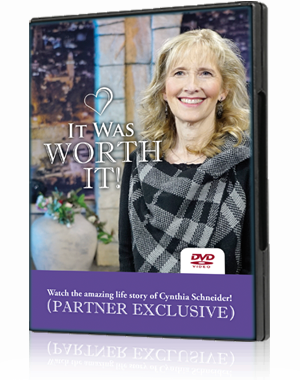 Cynthia shares her inspiring story and the faithfulness of God in her life. 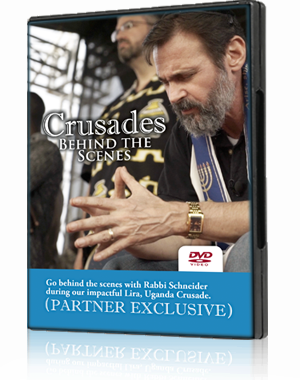 Go with Rabbi during our impactful Lira, Uganda Crusade.